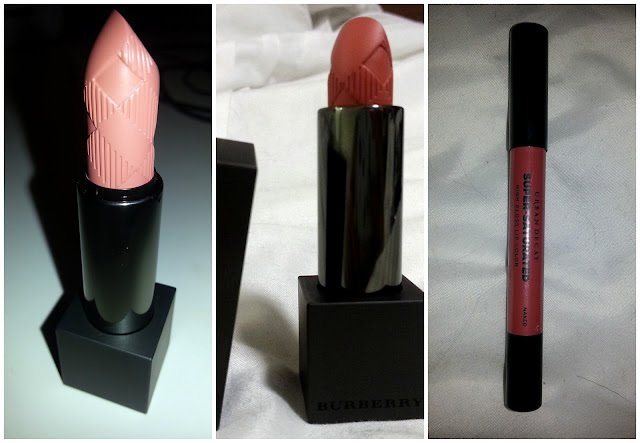 My fave items which are also new items (review coming very soon do not fear) are my Burberry lipstick, just because how glamorous can a lipstick get? it has the burberry logo embedded onto the stick. Absolutely beautiful. I cannot wait to wear it tonight. AND Urban Decays Super Saturated glossy stick, just incase I want a bit of gloss. I always put about 5 lipsticks in my clutch... and a lipgloss haha. Why pack lightly? You never know what opportunities could pop up! 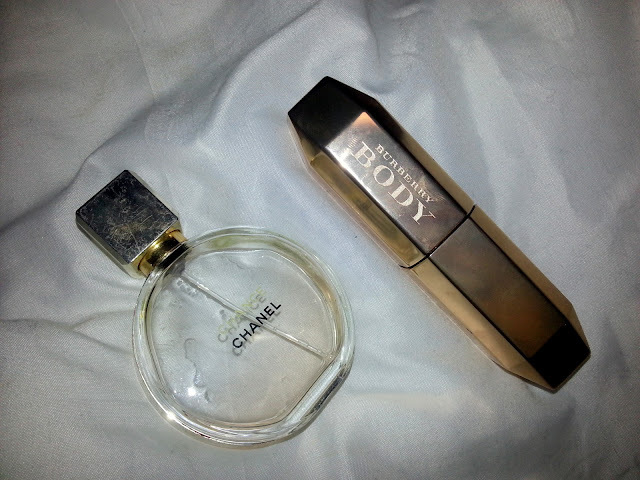 Perfumes. I pop these in my clutch because they're small and easy to carry around. I was given the Burberry Body when I was in London after the Cosmo Awards and I have got to say, I am now converted. I absolutely ADORE Flowerbomb but just maybe, I hate to say it, Burberry smells nicer. Please just go into a shop and smell it, I beg you. I didn't even realise that Burberry did perfume, where has this item been all my life. This is even a special purse version, perfect for clutches. I can't even explain what it smells like, it's just perfect I love Chance for a nice sweet fragrance, plus it fits into all my clutches really nicely. My boyfriends Mum bought me it for Christmas and i've been hooked ever since. I felt very lucky that Christmas! Never did I expect a Chanel perfume! 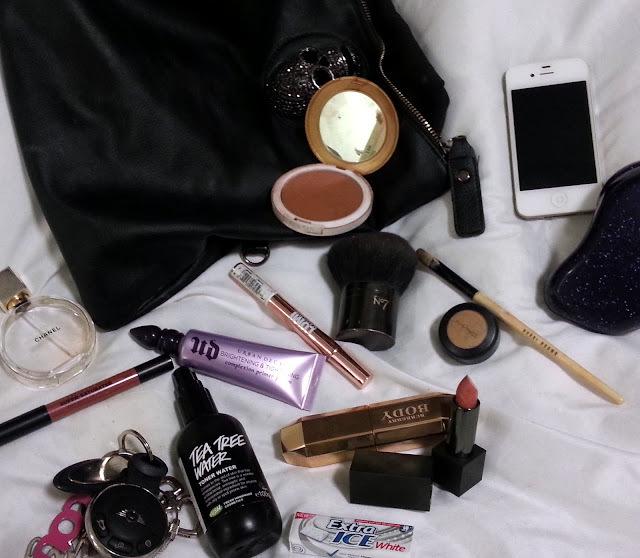 Of course I need some face things in my clutch. I always take my Xen-tan bronzer as it's my fave bronzer, but also I double it up as a powder if needs be (a very dark one, well actually, it isn't as dark as it looks in the case so long as you use a good blending brush) but I just like to take it everywhere with me because of the mirror. It means I've always got a mirror and a bronzer with me, plus it's so light weight that it's perfect for my clutch. Of course, my angel of face products, the Lumi Magique - just to quickly conceal if needs be. If anything major happens in the night though, I've always got my Mac concealer with my Bobbi Brown brush. Phew. Major disasters covered. Ready to take on the world. I never usually take this, but it had been boiling yesterday, in a humid kind of way and I lovee this product, so I want it to just spray over my make up if I feel myself getting sticky. 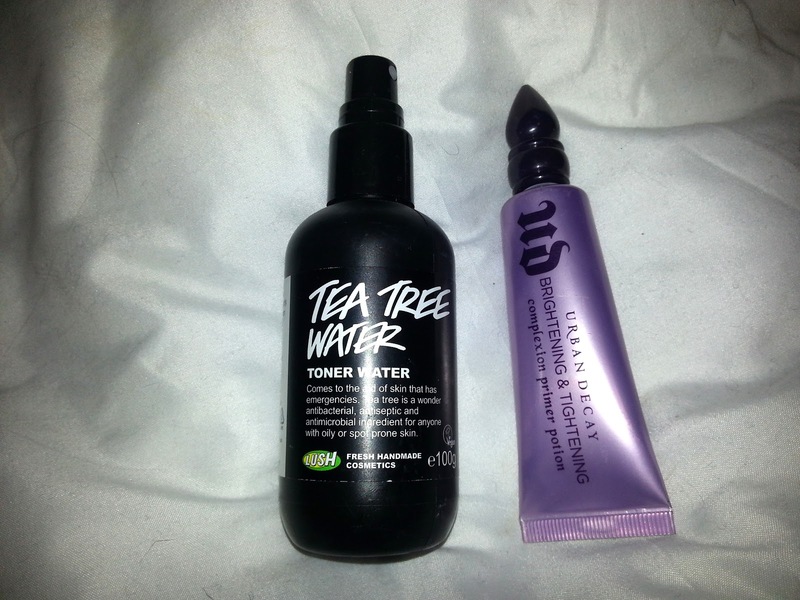 It really nicely refreshes my skin and make up, it just gives it a much needed lift at the end of the night or the middle of the night if you've been drinking too much. I popped the Urban Decay Brightening and Tightening primer in here because it's the best product I've used in a long time, a review will be coming later this week. I cannot wait to tell you all about my new Urban Decay's products. Then the boring stuff. Chewing gum for freshness, my car keys if i'm driving which I usually am if it's just a meal- with my beautiful Juicy Couture keyring! Also my tangle teezer to keep my hair looking fresh, especially if I'm curling my hair and I want to keep it bouncy, then just my NO.7 brush which just keeps the shine away. Okay,so this was supposed to be posted last night but I was running REALLY late so I apologise for posting this a day too late. What do you put in your clutch? What's your essential clutch bag item? Omg so many things, must be a massive clutch bag. 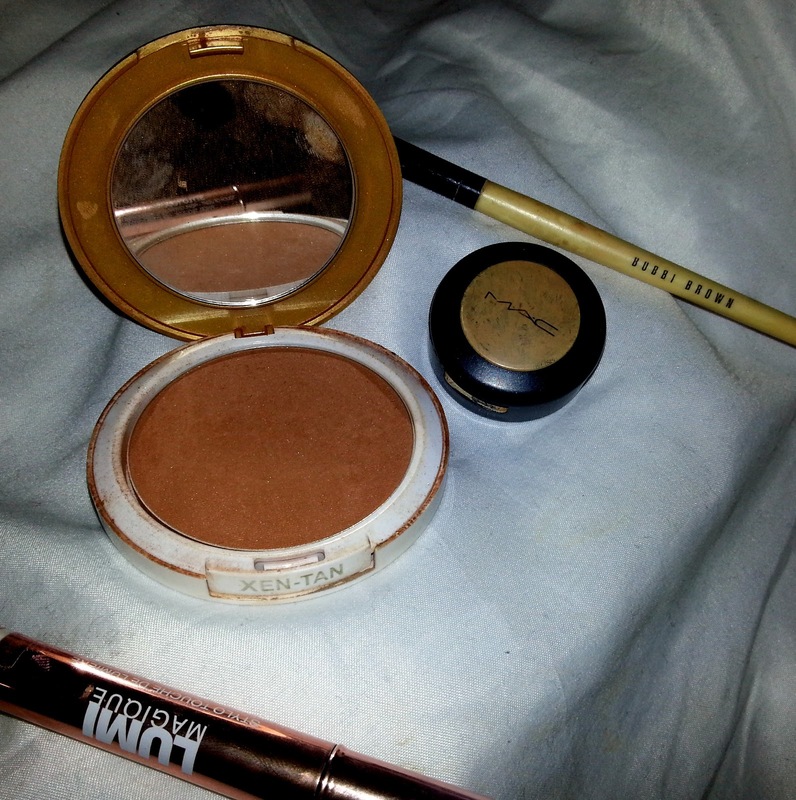 I usually take a poweder, blush, concelear, lipstick, purse, money, keys, ID. I'm getting the most amazing clutch bag for my birthday this year, it's so epic can't wait to get it. I LOVE, LOVE that clutch - great bag of supplies you have there!! Wooow ! Amazing :) YOu've got really beautiful things in your bag :)! And the bag is so cool too :)! We so have the same car :) recognise the keys a mile off! eeeeeeeeeeek we are mini twins!!!!!!!!!!! Great post idea em! Will be blogging about my birthday of Sunday so will incorporate this idea into the post! You have a beauty saloon inside your clutch! ahaha! I need to get my hands in one of those burberry lipsticks! Amazing blog dear :) Beautiful things on your clutch !! Would you like to follow each other?just let me know! Clutch bags,purses etc should be sized enough that we can put necessary things for daily usage into it. The main thing that i love about Knuckle Clutch is that these are properly sized and beautifully designed. Thanks for sharing information about your products. 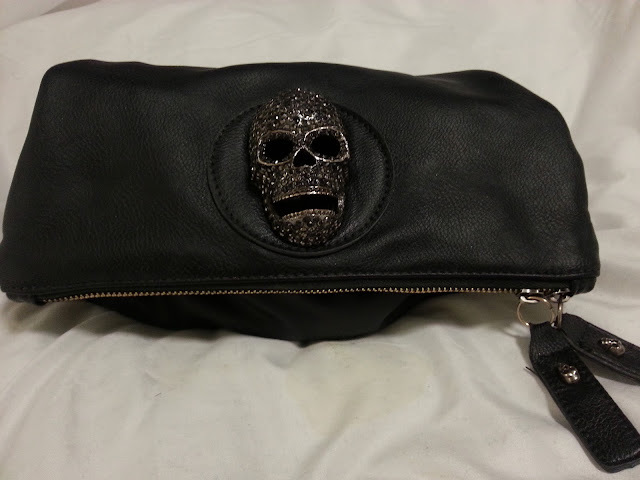 I like your black clutch bag its looking great in black color and also my favorite color is black.